Best grown in organically rich, medium moisture, well-drained soils in full sun to part shade. Can be trained as a small single trunk tree, but is best grown as a large, multi-stemmed shrub. 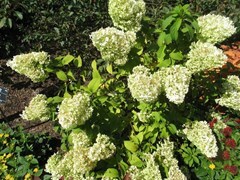 May display best shrub form if regularly pruned to a height of 6-10’ tall. This is one of the most winter hardy of the hydrangeas. It thrives in urban conditions. Bloom occurs on current season’s growth, so prune as needed in late winter to early spring. Larger flower panicles can be obtained by thinning the plants to 5-10 primary shoots. In full bloom, the weight of the flower panicles will typically cause the branches to arch downward. Specific epithet is in reference to the flowers being arranged in panicles. 'Ilvobo', commonly sold under the trade name of BOBO, is a compact cultivar that typically grows in an upright rounded mound to only 2-3' tall and to 3-4' wide. It is the product of an open pollination in a controlled breeding program that took place in Melle, Belgium in 2003 between Hydrangea paniculata 'Pink Diamond' (female parent) and an unknown Hydrangea paniculata (male parent). 'Ilvobo' is particularly noted for its dwarf/compact mounded shape, free branching habit, early flowering, strong stems, and conical flowering habit. Abundant sterile white flowers bloom early and profusely in large flower panicles (each to 11" long). Strong stiff stems hold the panicles upright with no drooping. Flowers gradually acquire pink to light purple tones as they mature. Flowers typically bloom from July through September. Ovate, serrate, dark green leaves (to 2 1/2” long) produce generally undistinguished fall color. Flower panicles may be cut for fresh arrangements or for drying, or may be left on the plant where they often persist into winter. U. S. Plant Patent PP21,008 was issued on May 25, 2010. No serious insect or disease problems. Some susceptibility to bud blight, bacterial wilt, leaf spot, rust and mildew. Aphids and mites are occasional visitors.